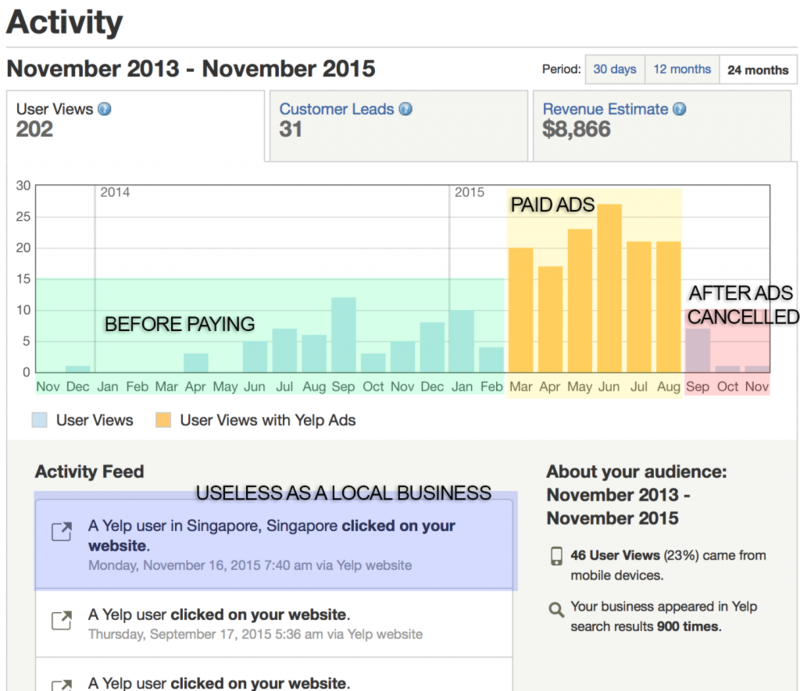 Is Yelp Scamming Small Businesses? Like you, I am a small business owner. I’ve got 2 businesses. As one of them is a website design & marketing company, I manage Yelp business pages for quite a few clients. I’ve witnessed the same issue with both of my companies as well as many of client companies (restaurants not included). Yelp tries to strong-arm you into signing a contract to advertise on their website regardless of the type of business you run. I’ve noticed a drop in page views DIRECTLY following phone calls where I don’t sign up for advertising (September 2014 & January 2015 in the second image below). The image above by the way is from a client that has been paying for ads whole time and hasn’t closed any new clients directly from Yelp that I’m aware of. When she asks, they say “I searched on the internet”. Hardly the statement of a seasons Yelper. Yelp went public March 2, 2012 and promptly started calling the businesses listed on their website to offer advertising. Originally there was no Pay Per Click (PPC) option. You chose from 1 of 3 advertising options which gave you a percentage of the advertising “real estate”. The minimum if I recall correctly was $300.00 per month for a minimum of 12 months. The first few calls in 2013 I said no. I didn’t see any change to my statistics. Come 2014 I received calls from a particular representative several times. He said they had change their strategy and now offered different advertising styles and more services than before. I said I’m interested in learning. After all, every single one of my clients are on Yelp and many of them receive A LOT of calls from the Yelp page I manage. I started grilling this guy on the keywords that were searched that led to my type of business… i.e., “Internet Marketing”, “Website Marketing”, etc. I told him that they could put my ad up all day long when someone searches for “mail marketing”, “direct marketing”, etc. and waste every penny I paid them. He got a little flustered at this and said he’d ask the number of searches for “MARKETING” on Yelp in the Tampa Bay area. I said I only care about searches leading to MY type of company. I get a call a couple of days later, and he proceeds to tell me that there are over 5,000 searches per month for my type marketing on Yelp in Tampa Bay. I knew at once he was lying. As of the day this is written, there are (on Google) 1,300 searches per month for “online marketing” and 1,600 searches per month for “internet marketing”. ON GOOGLE… So, long story short, I called him out, let him know he was lying to me and he ended up hanging up on me. I will say I was not polite to him about it, but I never swore or called him names. I merely matter-of-factly pointed out that it wasn’t okay and he was knowlingly lying to me. Interestingly this happened again a few months later from a woman who called me, but I think that she was new and simply didn’t know her job well yet. Fast forward through all the calls and into the year 2015, I decide to try it when they offer me $100.00 for free… If I pay them. So I do it. I find my ad on completely unrelated Yelp pages, but I run it for 6 months. I wasted every single penny as I suspected. 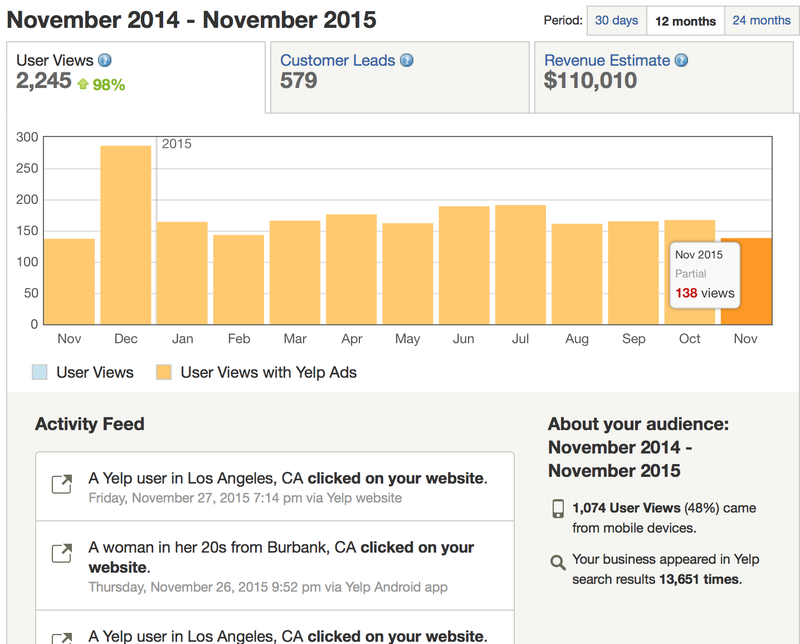 I receive 1 phone call from Yelp ads in 5 months and it was a fake (I’m not saying Yelp did this). Now I’m not saying that you can’t make money advertising on Yelp. Restaurants do quite well. But if you ask if Yelp users search for your type of business, the rep will likely straight up lie and give you search numbers that are likely from Google & Bing. I was ASSURED that the search numbers that I was being told were directly on Yelp, yet the numbers I was being told didn’t even come close to that on Google itself. I should add that I genuinely feel that Yelp is an excellent idea and I use it often in my personal life. I was in fact a member of the Yelp Elite until they found out I was a small business owner and revoked my membership. I was actually (at that time) one of the top reviewers and most active Yelpers in all of Tampa Bay. So I like Yelp… They just have some TERRIBLE business models in some respects and it ends up scamming some small businesses… Mine being one of them.